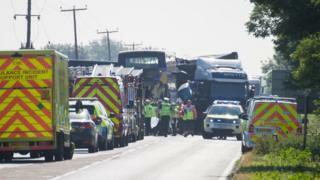 Two men died when a double-decker bus and a lorry were involved in a crash on the A47 in Cambridgeshire. Twelve other people were injured in the crash at about 07:30 BST on Thorney Road, Guyhirn. The driver of a First Eastern Counties bus, in his 50s, died, along with a passenger in his 70s. The collision, on a stretch of road with a 60mph speed limit, involved a Bretts Transport lorry near the entrance to its depot. Police said the bus "collided into the lorry". The lorry driver was not hurt. A Bretts spokesman said: "At this stage we are giving the emergency services our full support and co-operation." First Eastern Counties managing director Steve Wickers said: "Two people have lost their lives in this incident, one being a driver based in our King's Lynn depot. "I am shocked and saddened by what has happened. Our thoughts are with the families of the deceased and we will be providing as much support to them as we can through this difficult time." Cambridgeshire Police said five people were seriously injured and seven had minor injuries. Police said those who were seriously hurt had a combination of broken bones and head injuries, including brain injuries. The East of England Ambulance Service said the casualties had been transferred to Peterborough City Hospital and Queen Elizabeth Hospital in King's Lynn. 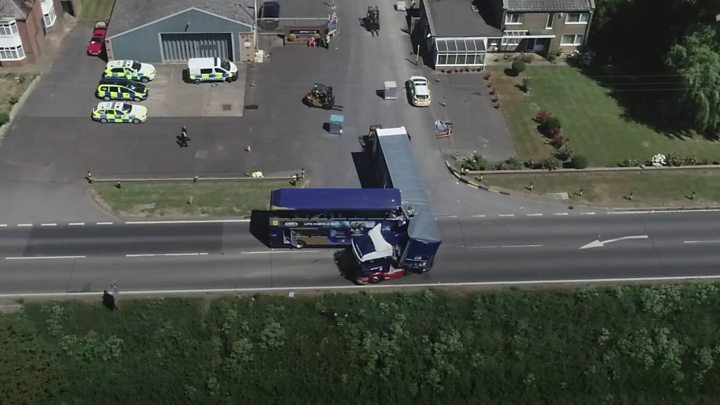 Insp Jamie Langwith, of the county's roads policing unit, said: "What we do know is that they have a coming together where the HGV has pulled out of the yard and the bus has collided into the side of it." The East of England Ambulance Service sent seven ambulance crews, three ambulance officers, two rapid response vehicles, and a Hazardous Area Response Team to the scene on Tuesday morning. Highways England confirmed the road had reopened shortly after 17:30 BST.